After a year of planning, painting and gathering, I finally got to play a Winter War scenario using the Chain of Command rules. Things generally went well, some adjustments in the terrain need to be made and there is still some work to do on the campaign design. For the test game, I went with the simplest scenario from the CoC rule book "The Patrol". Here we have two forces, who have yet to make contact carefully advancing through no-man's land to see where the other is. In our Raate Road campaign this represents the early stages of the battle where the Finns are advancing north through the snow covered forest from Vuokkijärvi to locate the Soviet 44th Rifle Divisions positions along the Raate Road. This was going to be an interesting game, as I had a platoon of Elite Finns and Mike had a platoon of Green Soviets. This meant that although I had 6 Command Dice and Mike had 4 and an advantage in starting morale, Mike had twice as many men and almost 4 times the support options. We diced for Morale, I started with 10 and Mike 7, I had 3 supports and he had 12. I picked the a Satchel Bomb and an an Anti-Tank Team. While Mike took a KhT-26 Flame Tank, a BA7 as well as a Maxim MG Team. I started my Patrol Markers in the lower right, Mike started in the upper left. I did not do well with 2 of my JOP's behind some snow drifts and 1 in the upper right.I got a sense we were doing something wrong here, I find this the toughest part of the game. Mike had one JOP in the forest and the other 2 in the forest. I laid down a LMG section behind the drifts in the northeast sector, Mike put down a Maxim Team on the hill to the west just outside of the photo. Although Elite, my teams are brittle because of their size and the Soviets appeared to be making short work of them, a HMG has a short range of 24" and takes cover down a notch so I was being pounded. Meanwhile I had put down a Anti-Tank team in the middle of the forest, which was a useless move and they were soon threatened by a large Soviet squad in the forest. Time to take off. 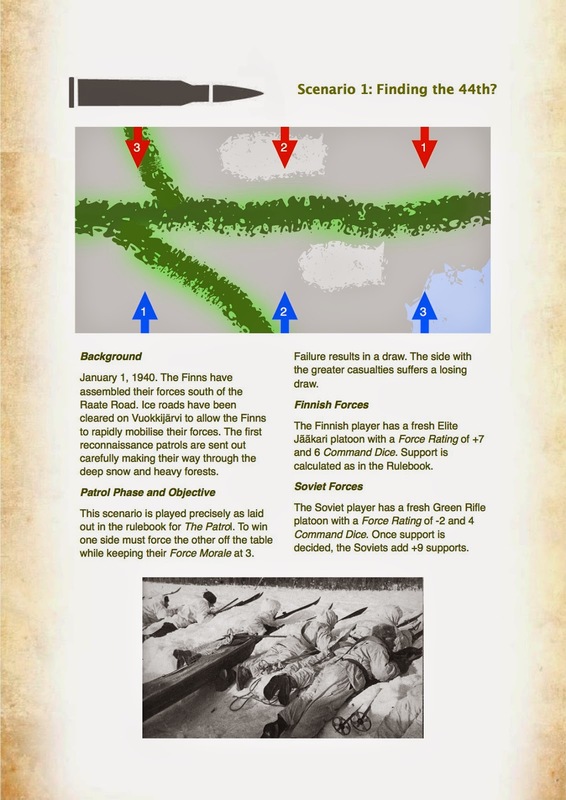 ...............but as you can see I lost my rifle team in the process, first morale loss to the Finns. Time to send in another LMG section, Mike immediately plunked down another Soviet squad but not before I took out the Maxim team, I almost immediately had a lucky shot and took out 1 of his SL's and soon after another JL, the Soviet morale was plummeting. The tide was turning. My second LMG team was now in close range of two Soviet squads. My Anti-Tank Team running away, with one of my SL's. 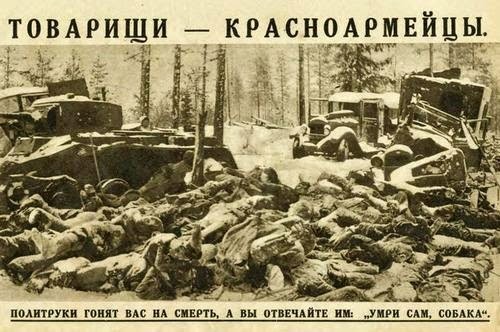 By now the Soviet squad in the woods had taken a ton of shock from the Finns from the south and from the northeast. Time to declare Rynnäkköön (very similar to the German Handgranten). My SMG section attacks the Soviets throwing grenades while advancing contact is made. The Soviet squads breaks, another SL and JL dies. Finnish Victory on morale. I made a lot of mistakes in this game and I still have a sense that we are messing up the Patrol phase, but otherwise the terrain and forces were workable. I am going to pull out a few trees from the stands to make it a little easier to get through the forests. There is still lots of work to do on the campaign structure, but I am hoping it will be a fun and interesting campaign. Anyway I will leave you with some photos of two other games that were going at the Hobby Bunker at the same time. First up was another winter game during the SYW, absolutely beautiful set up. I think now that I should of went with 18 mm for Napoleonic gaming, they are less fun to paint but they are just great for large games. The second game was an modern urban Southern Sudan game. I just love that UN compound, all the buildings are scratch built. great stuff. Your Winter War table is lovely! Thank you Monty, if I could only now get the campaign written. Fantastic terrain and enjoyable report. Must investigate Chain of command!